Replacing an inefficient hot water unit is one of the most significant low cost, carbon-reduction opportunities available to consumers today. Most people are aware of the three main ways to produce hot water for their home: electric, gas and solar. The fourth is the energy and cost efficient Quantum heat pump. 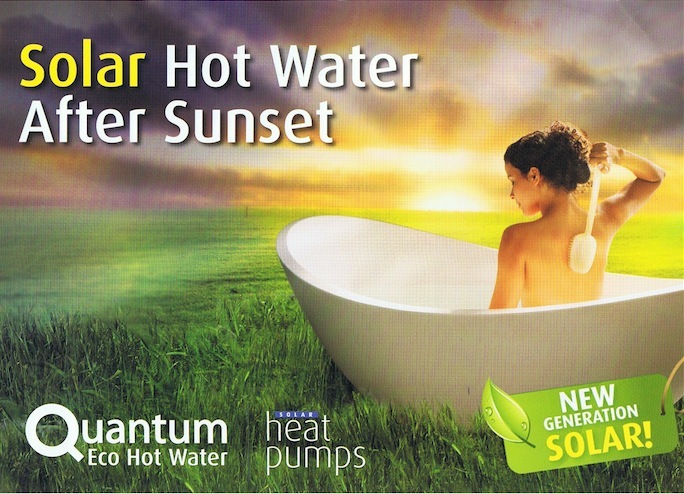 ￼ Installing a Quantum Eco Solar Heat Pump is almost identical to an electric water heater. There are no solar panels or special requirements, ensuring a simple and easy conversion to sustainable hot water for your home. We simply remove your old electric heater and replace it with a Quantum Eco Solar Heat Pump. A Quantum Eco Solar Heat Pump saves you energy, money and reduces greenhouse gas emissions once installed. State and Federal Governments are also rewarding those who install greenhouse friendly technologies. There are currently two financial incentives available in Victoria.